Summer pruning complements apple and pear thinning. 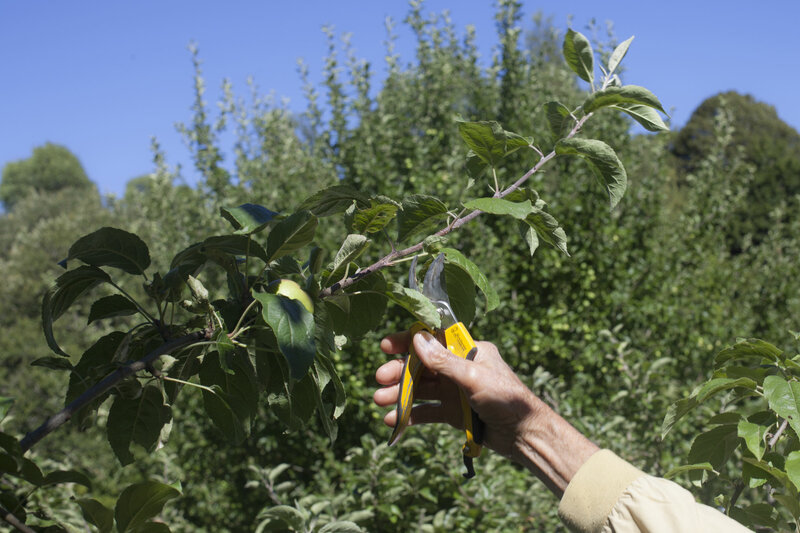 It is “the main method of pruning for restricted forms such as cordons, espaliers, fans and pyramids”, the British Royal Horticultural Society explain in their Summer pruning webpage. The French association “Les Croqueurs de Pommes” say it can also be applied to standard trees with great benefit. 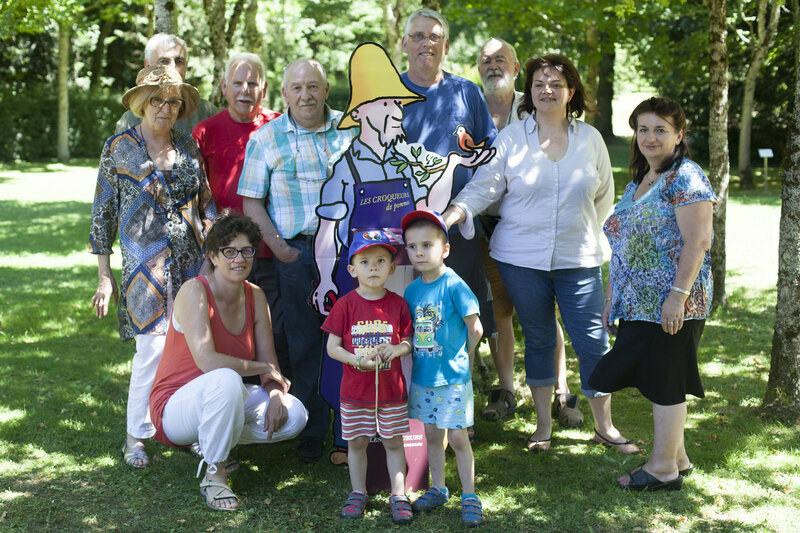 The Cantal section of the association, located near Aurillac, runs a workshop on the subject every July. 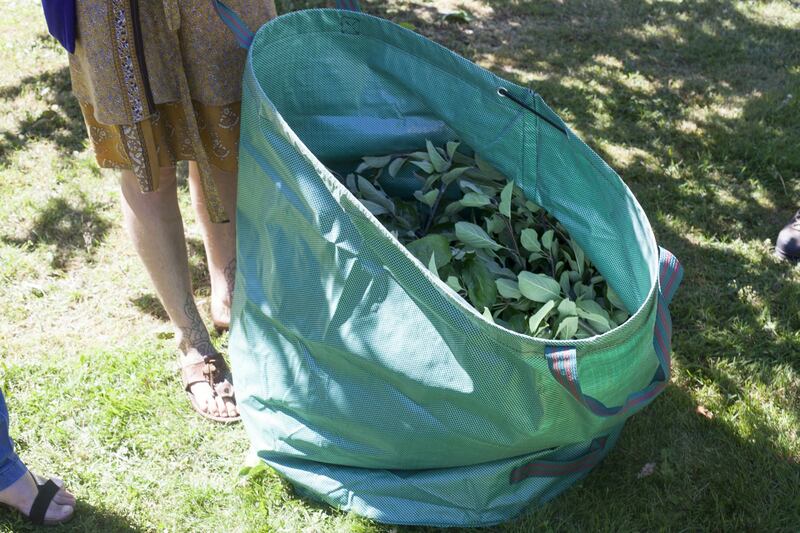 It is the last of its yearly series of half-a-day arboriculture trainings, which culminates in a picnic where trainees and organisers share the local food they brought and enjoy this moment of celebration of gardening and knowledge sharing. As usual, the workshop was divided in two parts: theory and practice. Summer pruning, or green pruning, consists in cutting new shoots to stimulate fructification. It is an easy thing to do on the lower branches of a tree. Apples and pears, fully benefitting from the sunlight and August sap, will be more colored, bigger and tastier. 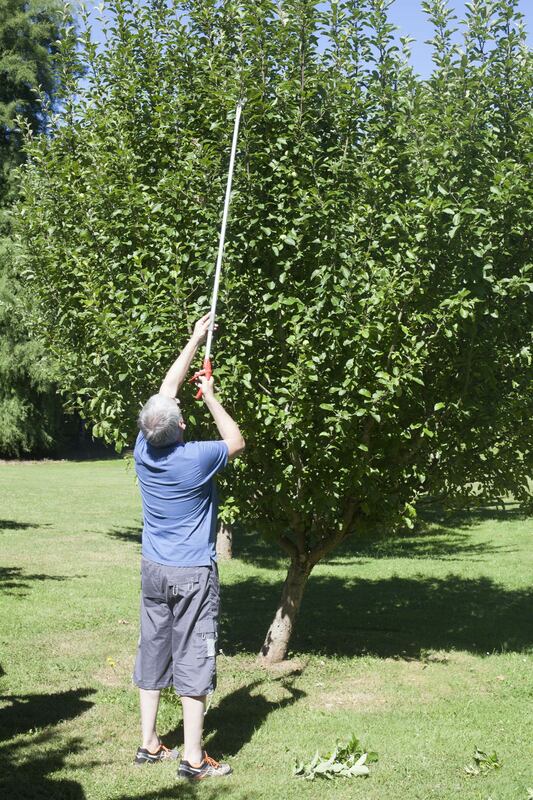 To realise how big the benefits are, our trainer suggested that we could carry out summer pruning on half of a tree, leave the rest of it untouched and compare the results when the fruit has ripened. There is one basic principle to keep in mind: the more vigorous the tree is at growing wood and leaves, the less it should be pruned, as otherwise it would be stimulated to grow even more leaves and wood. The less vigorous it is, the more it should be pruned, which helps the tree grow at its own capacity. Broad guidance: branches over fifty centimetres long are cut back by a third of their length, branches around twenty centimetres are cut back by a half. The shoots are normally cut above an outward-facing bud. This practice trainer will actually cut this 40 cm long shoot slightly shorter than described in the theory part, to keep this not too vigorous tree smaller. He will do it above a downward facing bud so that the branch can continue to grow horizontally next year. Fruit grow well on horizontal branches in which the sap moves more slowly. 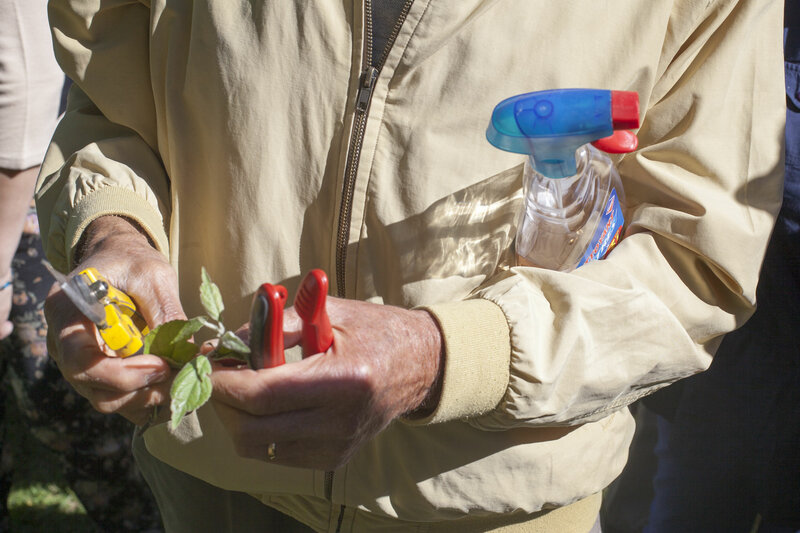 Methylated alcohol is being used to sterilise the pruning shear when going from one tree to another, to avoid transmission of diseases through sap sticking on the shear blades. Some trees, like this “Sainte Germaine” apple tree, tend to grow vertically. A light shear on a stick then proves very handy, yet this is a rather expensive tool. Smaller trees are easier to prune. The average height of this tree will be reduced by 60 to 80 cm this time. Cut shoots will be left to dry and then ground, to be used for mulching. 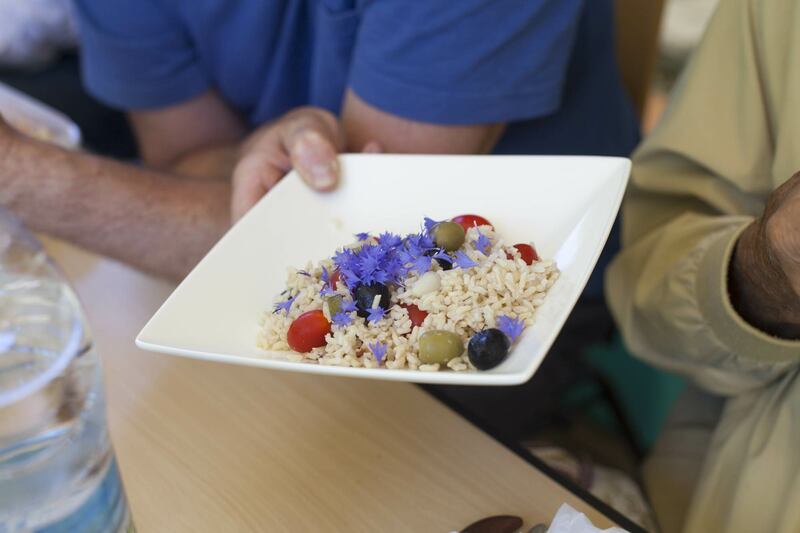 Picnic after the two-and-a-half hours workshop… Edible flowers found in the park were added to this rice salad. “Les Croqueurs de Pommes” after wrapping up the day. We were forty trainees in the morning. After an other year sharing best practice in a very practical and effective way, it is now well deserved vacation time for these dedicated volunteers!